Let the Body . . .
A couple of weeks ago, during one of this winter’s many snowstorms, I went out snowshoeing with my son and his girlfriend. They are both accomplished athletes, with bodies that are well-coordinated and very fit. While I work to maintain fitness, I have never been well-coordinated. I’m one of those people who can trip over a piece of string on the floor, and have bruises on my body from regularly bumping into things. We entered the woods behind our house and soon found a trail. Every now and then, we would slow down to take in the incredible beauty of the snowy woods. When it was time to start snowshoeing again, I noticed that they would easily fall into coordinated step with their snowshoes and their poles. I would struggle to think . . . now which pole goes down with which foot, trying to will my body to do what it’s supposed to do. And then I remembered. 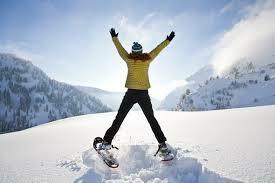 Let the body discover itself in the rhythm of snowshoeing. Stop thinking and let go. With ease, my body’s own sense of things would emerge and I’d fall into step. Years ago, when I first took voice lessons, I was eager to incorporate all of the techniques and ideas I was learning from my wonderful teacher. Breathe this way; articulate that way. Stand like this; warm up like that. Soon my head was swirling with all of these instructions; and the sounds that came out were not pleasing me, or my teacher. In her wisdom, my teacher stopped the vocal part of the lesson, and began the wisdom part. She told me about an amazing book, entitled Soprano On Her Head. The title comes from an experience the author had with a talented voice student. The student had a beautiful operatic voice; but she, too, got so wrapped up in trying to get her body to do what she wanted to improve her voice, that she felt more and more dissatisfied with the outcome. So the author asked her student to stand on her head, and then sing. What happened? Out came a voice and sound so beautiful they were both surprised. Why? Because by working hard to stand on her head, the student couldn’t think about all the things she thought she should do to sing more beautifully. She let her body, and her voice, discover itself. I’ve discovered, through the years, that my body holds great wisdom. If I am fearful or nervous, my body reacts right away. If I am not paying attention to my needs and emotions, my body will generate strong signals to get my attention. If I ignore the signs, my body will respond more strongly – I have a sleepless night; my stomach gets queasy; I have muscle aches. But if I stop and listen to my body wisdom, and allow my body – instead of my mind – take the lead, I am regularly surprised and delighted at what happens. I am restored to myself. I am able to live with a freedom and aliveness that comes from my very center. Let the body be your teacher. One step, one song, one morsel, one breath at a time. Let’s go snowshoeing again some time!